If your tanning bed has a 12" dark blue tinted glass with a bright and intense light around the head area of the canopy, then you have a bed with a "high pressure facial bulb". These specially formulated lamps made just for the facial area, only contain UVA light and emit 400 watts of high pressured intensity because they are manufactured under high pressure and will explode (so be careful). If you own a tanning bed with a facial lamp then you need to order THREE different size and types of replacements (F59, F71, 400w). The kits below contain all 3 sizes in different configurations. If you do NOT want to replace the facial lamp but need the other two sizes, click here. If you do not know your type of size of replacement, click here to learn how to buy tanning bed replacement lamps. You most like will discover you have the 100 watt, bi-pin type lamps which require a combination of long (F71), short (F59), and one 400 watt facial in your bed. Choose from 4 different levels of intensity below to suite your skin type and tanning history. For home tanning bed owners, even if your bed has a 20-30 minute timer, you can use these commercial tanning lamps but please do not tan more than the recommended maximum times listed below. These replacement lamps are made in the USA and will last more than 7 years in the home and are in use today in thousands of salons across the USA. For salons in regulated states, we have compatibility letter letter available for download here. call 800-667-9189 with questions or to place an order. All prices below include free shipping, insurance, free gift, and 1 year warranty. These are complete facial bed replacement lamp kits consisting of a number of long F71 type lamps, the shorter F59 type, and a 400 watt high pressure facial bulb. These convenient packages of our X6500 Bronzing lamps are designed to help save you money by combining all 3 lamps in one kit. You can expect a deep bronzing action with some initial reddening. These lamps will last over 7 years in a residential environment and 700 hours in a salon. All prices above include free shipping, insurance, a 1 year warranty and a free gift. Listed in this column is our "morning sun" type 17 minute max exposure lamp, the X7500 model. This indoor tanning bulb has a 7.5% UVB blend and is a big upgrade for most 20 minute tanning beds. You may place a 17 minute bulb in a 20 or 30 minute tanning bed because the bulb determines the max session times, not the timer on the bed. With this 17 minute lamp you can expect a deep, dark bronzing action with a bit more initial reddening. 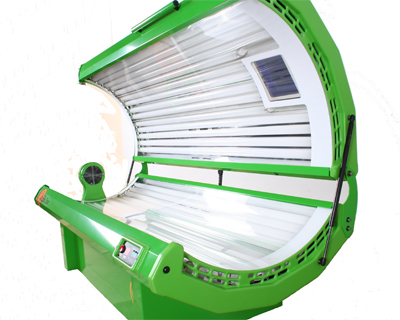 Compatible with Beach Sun 6.5, Equator Sun 7.5, and Wolf Velocity and Belarium S.
If you want your tan hot and fast, then consider the X8500 model 15 minute lamp which is much like the afternoon sun. This tanning bulb has a 8.5% UVB blend and is a significant upgrade for most 15 or 20 minute tanning beds. With this 15 minute lamp you can expect a deep, dark bronzing action with initial reddening and very intense heat during the tanning session. Listed above is our best selling 10 minute max exposure tanning bed bulb, the Panther. The Panthers have a 9.5% UVB blend and is the HOTTEST upgrade replacement bulb for ANY home tanning bed ever made. You can put a 10 minute bulb in a 30 minute tanning bed because it is the lamp UVB % which determines the max session times, not the timer on the bed. These Panther bulbs are compatible to many major brands, click here to see them all. Warning: these lamps will burn you in 3 minutes if you do not have a significant base tan. Cleaners and Sanitizers 160w - 220w Lamp Kits Tanning Bed Shocks What is an Automated Spa? Copyright 2001 - 2019 © TanLamps.com All rights reserved.